Peel and finely chop onion and two-thirds of the garlic cloves. Heat half of the olive oil in a large pot over medium heat and fry onion and garlic until translucent. Add risotto rice and keep frying until the rice gets translucent too, approx 5 min. Deglaze the pot with half of the white wine and let it simmer over medium-low heat until the wine is almost completely gone. First add the bay leaf, then alternating ladle in remaining white white wine and fish stock little by little, only adding more liquid once all the liquid in the pot is absorbed. Stir constantly. As soon as the risotto rice has soaked up all liquid and reached the perfect tender texture, add freshly grated Parmesan cheese and half of the butter. Season with salt and pepper to taste. Set aside. Heat remaining olive oil in a large frying pan and fry shrimp for approx. 1 – 2 min. or until cooked through. Add remaining butter, remaining garlic clove, basil, and lemon juice. Season with salt and pepper. 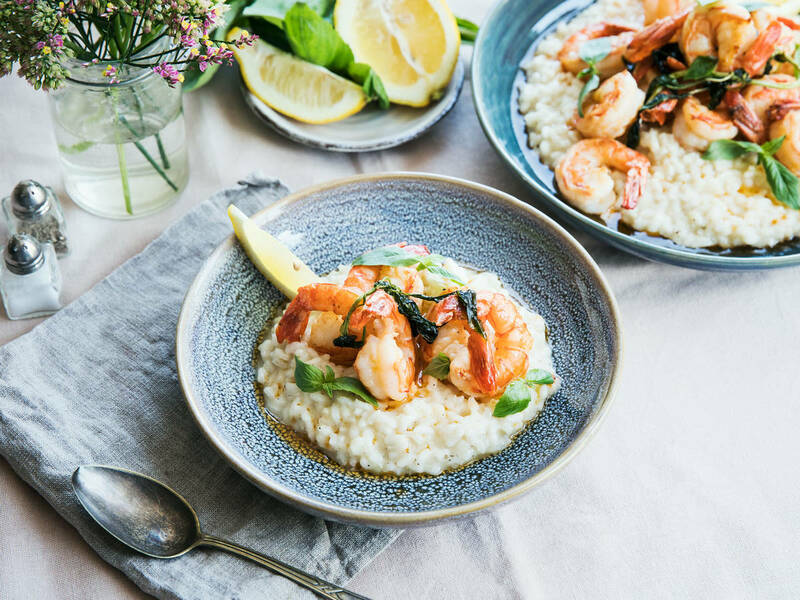 Serve risotto with shrimp on top. Enjoy!